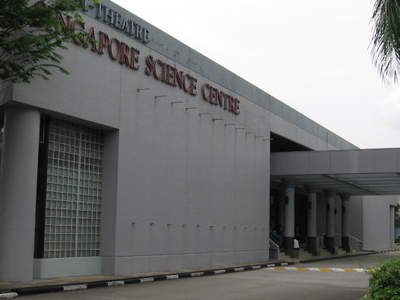 The Singapore Omni-Theatre is an observatory and IMAX film theatre located in the Science Centre, Singapore in the city-state Singapore, South-east Asia. It opened in 1977. The Science Centre house more than 850 exhibits, mostly interactive; the largest collection devoted to science in the city.As part of the larger Science Centre, it specifically encompasses an observatory, an omniplanetarium, and an OMNIMAX Projection System to show movies relating to science, astronomy, etc. A simulation theatre, exhibition room, class room, restaurant, and gift shop are also located on the premises. As one of the few observatories in the World located next to the Equator, constellations in both the northern and southern celestial hemispheres can be observed and thus opens up more vistas in the sky for observers.The main telescope of the Observatory is a 40-cm Cassegrain reflector of combined focal length 520-cm. The sub-telescope is a 15-cm apochromatic Kepler refractor of focal length 180-cm. The equatorial mount for the telescopes was designed for its location; the accompanying English yoke] provides the necessary stability for the drive and tracking mechanisms. The 5.5-metre stainless steel dome can be made to swivel in any direction and its shutter can be made to slide open for the telescope to be focused onto interesting objects in the sky. Here's the our members favorite photos of "Theaters in Singapore". Upload your photo of Singapore Omni Theatre! Get in touch with 2 Touristlink members who want to visit Singapore Omni Theatre or with Wills, Sascha and 1 others who already have been here.